Centralize your desktop management in your private cloud using VMware View. 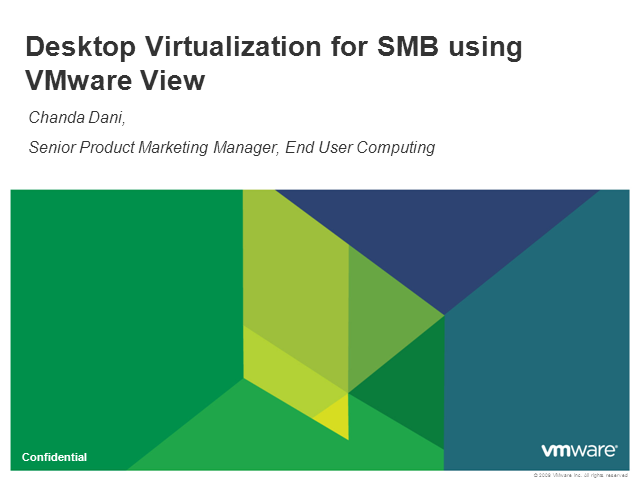 Learn about the benefits of desktop virtualization and how VMware View can enable you to achieve increased productivity, reliability, efficiency and a superior end user experience. PCoIP Management Console Release 3.2.1 delivers powerful endpoint management capabilities with support for Active Directory and User Roles. done that and got the T-shirt” pragmatic approach to help you digitally transform your respective companies. There is a lot of hype and misinformation out there regarding Digital Transformation. Join this live webinar as Becky removes the hype and discusses the “What, Why, How & Win” for why Digital Transformation is cornerstone for your company’s survival and ultimately thriving in a fast changing/continuous competitive marketplace. - I believe I can change the World – DO YOU? - Fail Fast & Carry On! In the storage world, NVMe™ is arguably the hottest thing going right now. Go to any storage conference – either vendor- or vendor-neutral, and you’ll see NVMe as the latest and greatest innovation. It stands to reason, then, that when you want to run NVMe over a network, you need to understand NVMe over Fabrics (NVMe-oF). TCP – the long-standing mainstay of networking – is the newest transport technology to be approved by the NVM Express organization. This can mean really good things for storage and storage networking – but what are the tradeoffs? •What should network administrators know? •What kind of expectations are realistic? •What technologies can make NVMe/TCP work better? Brought to you by the Vivit Performance Engineering Special Interest Group (SIG). Most of you may have heard about or experienced Micro Focus Service Virtualization (SV) by now. This webinar is not about explaining what it is or what value it brings to an IT organization. Instead, it is about sharing one team's collective experience with implementing Service Virtualization Center of Excellence (CoE) practices at a major pharmacy retail chain company located in Chicago, Illinois. • SV Housekeeping. What's involved? Discover what's trending in the Enterprise Architecture community on BrightTALK and how you can leverage these insights to drive growth for your company. Learn which topics and technologies are currently top of mind for Data Privacy and Information Management professionals and decision makers. Tune in with Jill Reber, CEO of Primitive Logic and Kelly Harris, Senior Content Manager for EA at BrightTALK, to discover the latest trends in data privacy, the reasons behind them and what to look out for in Q1 2019 and beyond. Audience members are encouraged to ask questions during the Live Q&A. Enterprise Architecture is dead. Long live Enterprise Architecture! In the face of DevOps and Agile development methodologies, many enterprises have backed off entirely from the concept of an enterprise architecture. That's a mistake. Enterprise Architecture is needed more urgently than ever before--but not the old, silo-ed, inflexible architecture. Next-generation Enterprise Architecture needs to be fast, flexible, and as adaptive as next-generation development methodologies. It needs to encompass the radical changes in infrastructure, from virtualization to cloud- and mobile-first. And it's absolutely essential for enterprises who want to align their technology investments with their fast-moving business goals. This webinar reviews the fundamentals of enterprise architecture and provides a blueprint for a next-generation EA that encompasses DevOps, cloud, mobility, virtualization, microservices, and more! Today's demand for high-speed everything brings potential unforeseen challenges to your infrastructure environments. A single rogue failure or a noisy neighbor can result in a loss in customer satisfaction or confidence. Plus, when your virtualized applications delivery infrastructure are siloed, small problems can turn into big situations. This all quickly leads to the all too familiar IT war room scenarios. Does your enterprise experience application outages and/or application slowdowns? For those who have experienced these problems, you also have experienced the IT war room, which conjures memories of extreme inefficiencies - from tedious conference calls, to blame storms, with each person ready to be the first to prove their innocence, rather than contribute to solving the problem at hand. How did we get here? Hundreds of companies, both old and new, are providing technology designed to improve customer engagement, ultimately raising customer experience scores. Everything from contact center to CRM to user sentiment to in-app contextual communications to many more areas are part of the customer engagement movement. This first episode of our Digital Customer Experience series serves as a tutorial of technology categories and providers assisting in any customer interaction and analytics to evaluate success. The “Great Storage Debates” webcast series continues, this time on FCoE vs. iSCSI vs. iSER. Like past “Great Storage Debates,” the goal of this presentation is not to have a winner emerge, but rather provide vendor-neutral education on the capabilities and use cases of these technologies so that attendees can become more informed and make educated decisions. One of the features of modern data centers is the ubiquitous use of Ethernet. Although many data centers run multiple separate networks (Ethernet and Fibre Channel (FC)), these parallel infrastructures require separate switches, network adapters, management utilities and staff, which may not be cost effective. Multiple options for Ethernet-based SANs enable network convergence, including FCoE (Fibre Channel over Ethernet) which allows FC protocols over Ethernet and Internet Small Computer System Interface (iSCSI) for transport of SCSI commands over TCP/IP-Ethernet networks. There are also new Ethernet technologies that reduce the amount of CPU overhead in transferring data from server to client by using Remote Direct Memory Access (RDMA), which is leveraged by iSER (iSCSI Extensions for RDMA) to avoid unnecessary data copying. •What are the advantages and disadvantages of FCoE, iSCSI and iSER? •What software and hardware do they require? •How are they implemented, configured and managed? •What do you need to do to take advantage of them in the data center? •What are the best use cases for each? Join our SNIA experts as they answer all these questions and more on the next Great Storage Debate. FICON (Fibre Channel Connection) is an upper-level protocol supported by mainframe servers and attached enterprise-class storage controllers that utilize Fibre Channel as the underlying transport. Mainframes are built to provide a robust and resilient IT infrastructure, and FICON is a key element of their ability to meet the increasing demands placed on reliable and efficient access to data. What are some of the key objectives and benefits of the FICON protocol? And what are the characteristics that make FICON relevant in today’s data centers for mission-critical workloads? Are you a control freak? Have you ever wondered what was the difference between a storage controller, a RAID controller, a PCIe Controller, or a metadata controller? What about an NVMe controller? Aren’t they all the same thing? In part Aqua of the “Everything You Wanted To Know About Storage But Were Too Proud To Ask” webcast series, we’re going to be taking an unusual step of focusing on a term that is used constantly, but often has different meanings. When you have a controller that manages hardware, there are very different requirements than a controller that manages an entire system-wide control plane. From the outside looking in, it may be easy to get confused. You can even have controllers managing other controllers! •How are the systems being managed different? •How do controller systems work, and what are the trade-offs? •How do storage controllers protect against Spectre and Meltdown? Join us to learn more about the workhorse behind your favorite storage systems. When it comes to storage, a byte is a byte is a byte, isn’t it? One of the truths about simplicity is that scale makes everything hard, and with that comes complexity. And when we’re not processing the data, how do we store it and access it? The only way to manage large quantities of data is to make it addressable in larger pieces, above the byte level. For that, we’ve designed sets of data management protocols that help us do several things: address large lumps of data by some kind of name or handle, organize it for storage on external storage devices with different characteristics, and provide protocols that allow us to programmatically write and read it. In this webcast, we'll compare three types of data access: file, block and object storage, and the access methods that support them. Each has its own use cases, and advantages and disadvantages; each provides simple to sophisticated data management; and each makes different demands on storage devices and programming technologies. Recently in the IT world it has been announced that VMware may make a reverse merger/acquisition of its current parent company Dell. Reverse mergers, especially with companies as large as these, are pretty rare in the tech world and if it goes through, this could be the biggest tech deal yet. Does this type of reverse model hold water as a successful digital transformation strategy? In regards to process innovation and business model innovation, what does it mean for customer value creation? - What can other companies and parent companies learn/take away from this type of deal? Join us for a fast-paced and informative 60-minute roundtable as we discuss the latest—and potentially most game-changing—technology disruptors to traditional storage architectures since flash: NVMe over fabric and Storage Class Memory. It was just five years ago that Flash technology transformed the traditional storage market forever. Modern flash-first arrays are now the new normal for traditional storage. Will a new shared storage access protocol called NVM express over Fabric (NVMe-oF) combined with the advent of storage class memory (SCM) be equally disruptive to traditional storage over the next five years as NAND flash technology was in the past? Vendors are now announcing new products and future architectures to enable them to support these new technologies. With the help of a lively panel of experts from HPE, Pivot3, and Mellanox, we will unpack this topic and explore how their innovative approaches to leveraging Storage Class Memory and NVMe-oF can radically improve storage products and solutions. As people learn more about Fibre Channel and are curious about NVMe over Fibre Channel (FC-NVMe), more questions arise that relate to how storage solutions are going to be affected by the new technology. Perhaps the least understood aspect of storage networks involves distance solutions, and so FCIA has decided to tackle this issue next. •How does Fibre Channel work over distances? •What are some of the limitations of distance? •What happens when you are using FC-NVMe? •What special equipment do you need? Come spend time with FCIA and speaker Mark Allen, Technical Marketing Engineer Manager for Cisco, to learn how to understand and plan for distance solutions using Fibre Channel. Agile works well for small, co-located teams that can hover around sticky notes on a Kanban board, and collaborate on-demand. But as initiatives become more complex, and teams become dispersed, Agile can be difficult to scale across the enterprise. What’s missing in Agile practices today is the ability to see the whole picture. With user stories as the source of record for an application, it’s hard to connect all the dots to see the complete functionality of a feature or capability. Think about the new team who will be developing additional features on that capability - where can they learn everything it does today? How will they know the impact their changes will have on that capability or potentially other capabilities? How will they collaborate on those changes and get them reviewed in a timely manner? How will your business stakeholder understand the impact of new those changes to the overall business process? Storyteller provides a centralized reusable searchable repository of exiting business and technical process models and requirements (business, non-functional and regulatory). In addition we also offer rich visualization, collaboration and review functionalities. These base capabilities are being used today to address the questions above. And - we do it in a way that everyone can understand from Business Stakeholders down to developers and testers. Storyteller is a key player in Enterprise Agile. We bridge the business gaps in the current agile process. For companies struggling with Agile Transformation, we providing guardrails around writing user stories and feature decomposition. Project teams can save time and effort by using our user story and test plan generation which can them be automatically synched over to ALM tools. We are also a key player in the BizDevOps chain by providing that upfront business alignment so what is produced though “Dev” and delivered and maintained by “Ops” is exactly what “Biz” wanted. Originally restricted to making better use of physical servers, virtualization has grown to power anything and everything in the modern data center. Along with the technology came the luxury to simplify the provisioning of resources as they are needed. In this webinar, we will explore how virtualization can be leveraged to quickly and cheaply create servers on-demand and avoid the lengthy delays associated with handling and cabling physical hardware. Join Petros Koutoupis, Lead Linux Systems Developer for IBM Cloud Object Storage, for a technical deep-dive into Linux operating systems running on virtual machines. Virtualization is no longer a passing trend. Organization deploying it in their servers, desktops, storage and networks are experiencing increased performance and decreased costs, when implemented and managed properly. Join this channel to hear leading experts discuss this maturing technology and how you can create your own software-defined data center.